THE VALUE of scoring the first goal of the game wasn’t missed on Derry City defender, Dean Jarvis who believes his goal inspired confidence and settled the nerves as the Candy Stripes finally ended a six game winless run in the league. And the number five - worn by the late Ryan McBride - also proved symbolic on the fifth day of the fifth month as Derry registered a fifth win of the campaign and secured a first clean sheet since the ex-City skipper’s final match in the 4-0 win over Drogheda United on March 18th! Fitting too that the man who has been chosen to replace McBride at the heart of the City defence is another Brandywell native who, himself, has developed a habit of popping up with important goals. 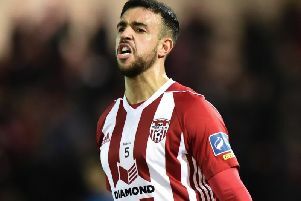 Jarvis’ 31st minute glancing header was the defender’s sixth Derry City goal and his second of the season, scored in front of his parents who were celebrating their wedding anniversary. While it was nice to get on the scoresheet, he insists the clean sheet was his main objective prior to kick-off. “Our main objective was to stay solid when we were attacking and try and keep a clean sheet and hopefully get a couple of goals and that’s what happened,” said Jarvis. “We still wanted to go out and play like we always do but our main objective was to keep a clean sheet as we knew we would create chances. “I just tried to lose Rob Cornwall who was marking me in the box and it came straight to me and I stuck my head on it and it glanced into the net. I didn’t see it going in as there was a couple of bodies in front of me but I heard the crowd shouting. But I’m nearly top goalscorer now,” he laughed. And it was clear from the start Derry were going to be a lot more cautious when in possession and the back four were marshalled well by Jarvis’ centre half partner, Aaron Barry. Albeit City were up against a toothless Bohs side, when Jarvis rose to head in Aaron McEneff’s free-kick the confidence was finally back. I didn’t see it going as there was a couple of bodies in front of me but I heard the crowd shouting. But I’m nearly top goalscorer now. Having trailed four times in their previous three outings Jarvis felt scoring that first half opener eased the pressure and anxiety which was festering among the support in the Maginn Park stands. At last they got their noses in front and could relax in possession. And when Ben Doherty was brought down just inside the box for a blatant penalty kick in the second half, Aaron McEneff converted confidently from the spot for a second time after referee, Rob Harvey ruled the first out when Bohs players encroached. Derry have played better football during that seven match winless run but this performance was by far the best from a defensive perspective as they controlled the game from the start and restricted Bohs to just one chance of note which came in the opening five minutes. The Dubliners had clearly learned their lessons from the opening day 4-1 defeat to Derry at Dalymount where they were picked off on the counter and they were set up to frustrate. Jarvis has always offered a great attacking threat for City from his natural left back or wingback position but whether it’s just a stopgap or a permanent move to centreback, he’s happy to fill in wherever needed. “Obviously it’s not my natural position but after what happened to Ryan (McBride), I’ve come into do a job. I feel comfortable enough there. I’m not the biggest but I just try and read the game and the way Kenny (Shiels) likes to play our from the back - it suits me. ““A few times I got the ball and tried to drive out from defence and I heard Aaron (Barry) shouting behind me to get me back in because I’m away up the pitch, losing my head a bit. But we have enough players there to cover if you do go forward.